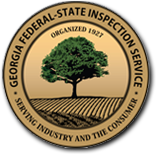 USDA and Georgia Federal-State Shipping Point Inspection Service, Inc.
GA FSIS offers GAP & GHP Audit Verification Program which is a voluntary, fee for service program. Audits are only performed by USDA trained and licensed Federal or State department of agriculture employees. USDA AMS Fresh Products Branch works in cooperation with States to ensure program integrity, uniformity, and consistency nationwide. USDA trained and licensed auditors provide an unbiased review of growers, handlers, or receiver’s practices to minimize food safety hazards. This program verifies that the participating companies are conforming to generally accepted agricultural best practices. This program is not a regulatory or mandatory audit required by any State or Federal regulation. » Visit the USDA's website and learn more about Grading, Certification, and Verification.